Unsightly Rust stains are frustrating and can make an otherwise clean look unkept, unclean and abused. ASAP offers the Front 9 Restoration advantage to restore the rusted surface to its natural state. 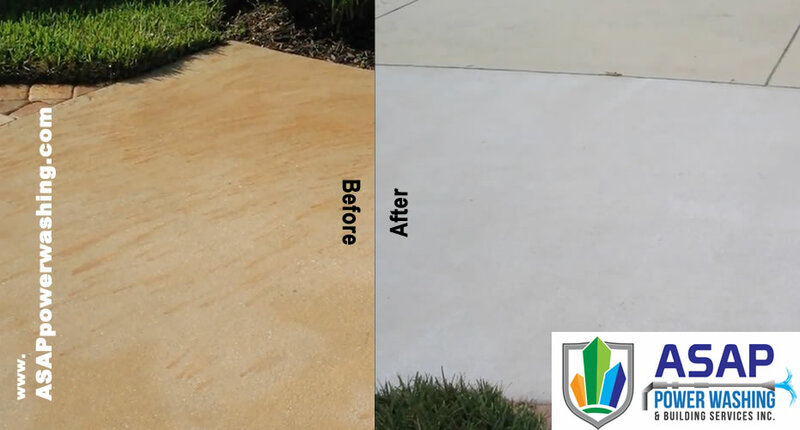 The combined forces of ASAP Power Washing and this revolutionary product can achieve tremendous Rust Stain Removal results for stains such as Fertilizer Rust Stains, Battery Acid Rust Stains and Irrigation Sprinkler Rust Stain. The auto industry has also seen this advantage because it also removes automobile radiator rust stains. Fertilizer Rust Stains are caused when excessive fertilizer pellets make contact with concrete. Moisture from rain, morning dew or a sprinkler system will cause the pellets to weep and leave evidence of rust stains on the concrete. Battery Acid Rust Stains can also be treated with F9 Restoration. ASAP Power Washing can help you remove exterior rust; giving your business or your home a positive first impression! LET'S TALK ABOUT YOUR RUST! an appointment to discuss details.